I thought about making a festive holiday cake. Perhaps another version of this chocolate peppermint cake or this candy cane cookies and cream cake. But in all honestly, I’m not really feeling the holiday spirit…yet. Over the weekend we decorated the house with wreaths and garlands, and hung our stockings on the mantle above the fireplace. I recently saw The Nutcracker (featuring Misty Copeland!) and I’m still feeling like Scrooge. For one reason or another, I’m just not feeling the candy canes, gingerbread, or eggnog yet. I need a pick-me-up. And what’s the BEST pick-me-up ever? Tiramisu, you say? NOPE. Tiramisu cake! I decided to make this tiramisu cake in the style of Christina Tosi’s Momofuku cakes. 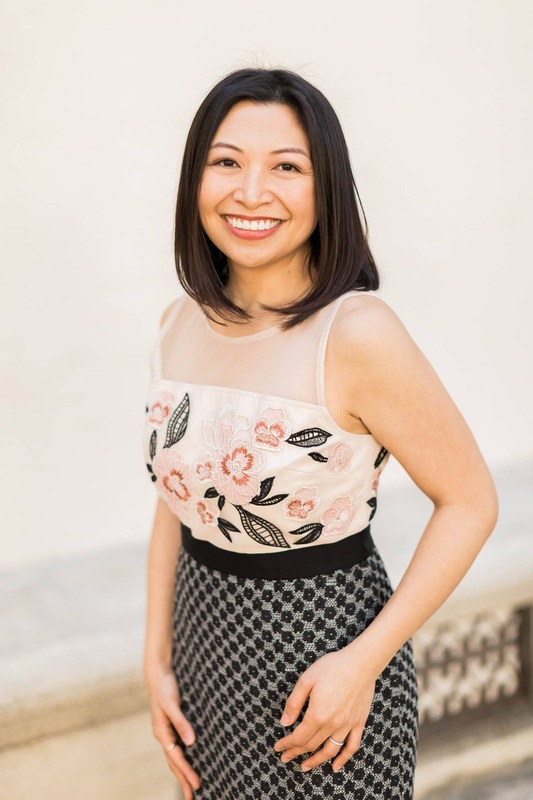 I’m a big fan of her creations. I have to stop by MilkBar whenever I’m in Las Vegas (which is often) to get my fill of corn cookies, cereal milk soft serve, and crack pie. You will need a cake ring lined with acetate to assemble this cake. The soft and creamy texture of the mascarpone sabayon is not strong enough to handle cake stacking on its own. 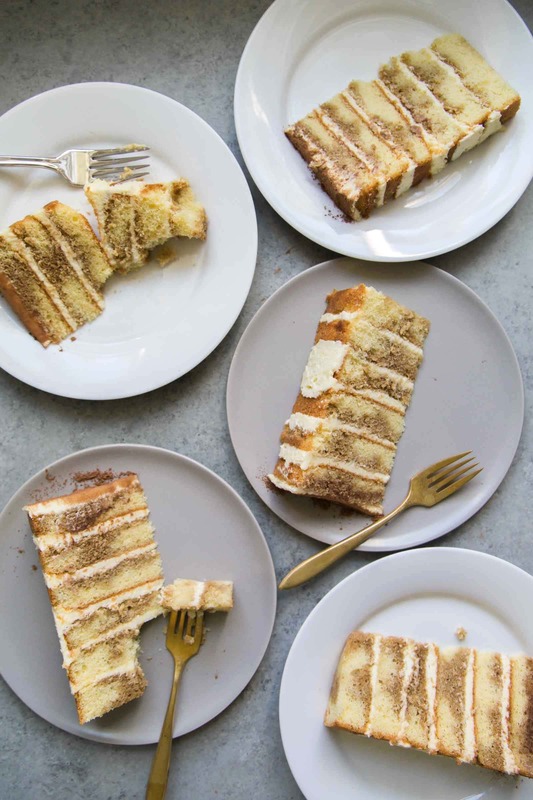 What components make up a tiramisu cake? Tiramisu is a layered dessert traditionally made with ladyfinger lightly soaked in an espresso-marsala syrup and topped with mascarpone sabayon. For the finishing touch, it is garnished with cocoa powder or chocolate shavings. I made a traditional tiramisu over here. I used the same components to make this tiramisu cake. 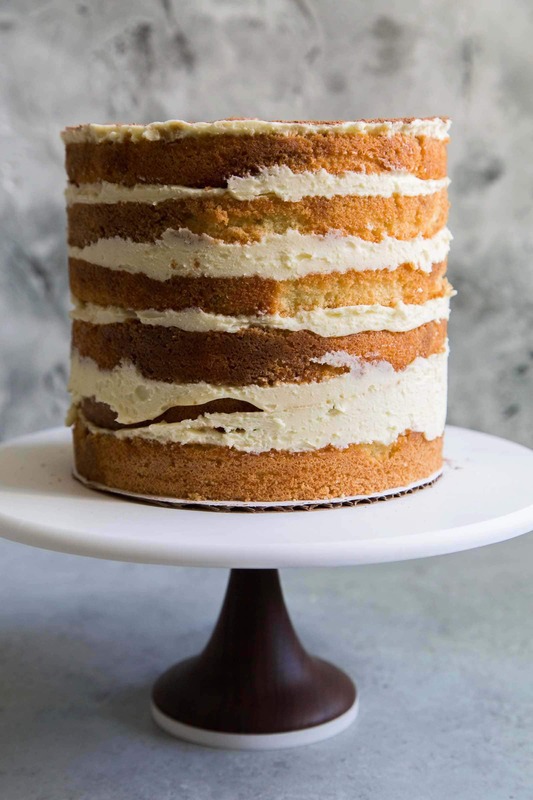 Genoise (aka vanilla sponge cake) is the perfect substitute for ladyfingers. They’re basically the same thing. The two batters are made in the same fashion. They taste the same and have very similar texture. Genoise cake is sweet, very sweet. And the cake is a bit dry. It requires a soaking syrup to help softened it. I used strong espresso mixed with marsala wine and a splash of dark rum for the soaking syrup. No need to add sugar because the genoise cake is sweet enough. Sabayon (also spelled Zabaione) is a sauce made from egg yolks, sugar, and sweet wine (or liquor). Some classic version calls for raw egg yolks. I’m not adventurous or brave like that. The eggs in this recipe are gently cooked over a bain-marie until they’re at a safe temperature. The resulting sauce is similar to custard (or melted ice cream). Sabayon is commonly drizzled over fruits for dessert. For tiramisu cake purposes, the sabayon is folded with mascarpone cheese to make a rich, luscious creamy mixture. 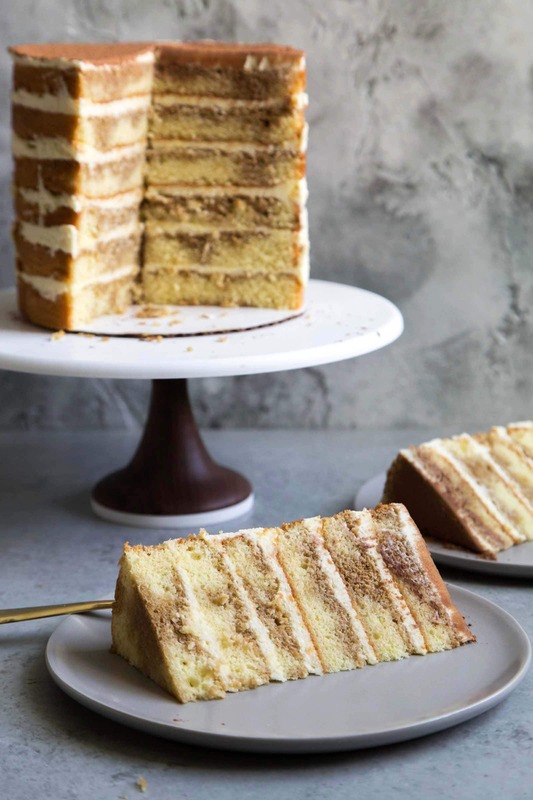 This recipe makes a six layer 6-inch cake like the one photographed here, or a four layer 8-inch cake. See those splotches of brown in the cake? I simply spooned the soaking syrup over the genoise cake layers. I like the way it works in this cake. However, if you want a more uniform distribution, use a pastry brush. Preheat oven to 350° F. Lightly grease three 6-inch cake pans and line with parchment paper. (Alternatively, use two 8-inch cake pans). Melt butter and set aside to cool. In the bowl of a stand mixer, whisk together sugar, eggs, and egg yolks. Set over a pot of barley simmering water (bain-marie)*. Whisk constantly until egg mixture reaches 110° F on kitchen thermometer. Remove from heat and attach to stand mixer fitted with whisk attachment. Whip on medium speed until mixture has increased more than double in volume, about 3-5 minutes. Sift cake flour over egg mixture. Gently fold to distribute into batter. Take a couple tablespoons of batter and mix it into cooled butter along with vanilla extract. Fold this tempered butter mixture into the rest of the cake batter. Fold until there are no longer any dry streaks of flour. Evenly distribute cake batter among prepared cake pans, about 2/3 full. Bake for 28-30 minutes until the top of cake is lightly browned, firm to the touch, and toothpick inserted in center of cake comes out clean. Allow cake to cool in pan for 3 minutes. Run a butterknife along the edges of the cake to help release. 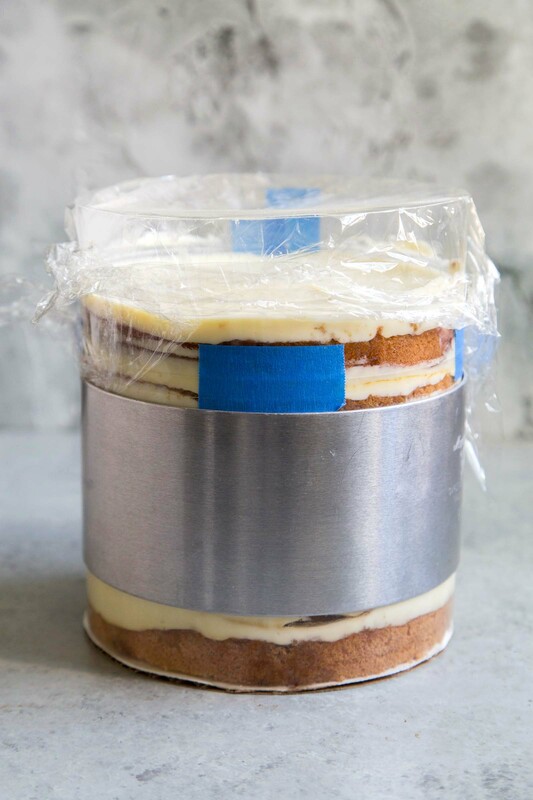 Unmold and allow cakes to cool to room temperature on a wire rack. 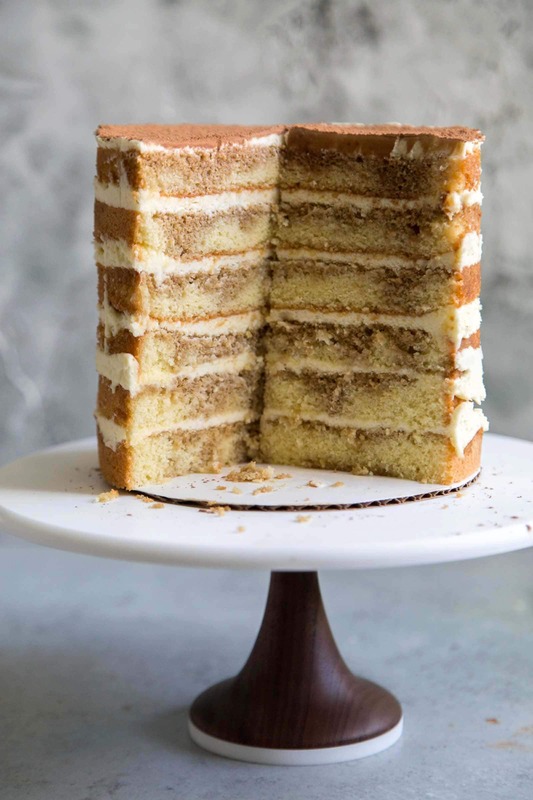 Once cakes have completely cooled, slice each layer in half to end up with 6 layers for 6-inch cake or 4 layers for 8-inch cake. Combine espresso, marsala wine, and dark rum. Set aside until ready to use. In the bowl of a stand mixer, combine sugar, egg yolks, and egg. Place over a pot of barley simmering water. Continually whisk mixture, it should become pale yellow in color. Continue to whisk until mixture has slightly thickened and reaches a temperature of 140° F on kitchen thermometer. Remove from heat and attach to stand mixer fitted with whisk attachment. Whip on medium speed until the hot mixture has cooled to room temperature. Stop machine and add the mascarpone in two additions. Whisk on medium speed until smooth. Add vanilla and rum. Mix until incorporated. Line cake ring with acetate sheet. You may have to tape several acetate sheets together to accommodate the height of the cake. Place one cake layer into lined cake ring. Brush or drizzle about 3-4 tablespoons of marsala rum syrup over cake. Top with a rounded 1/3 -1/2 cup mascarpone sabayon filling. 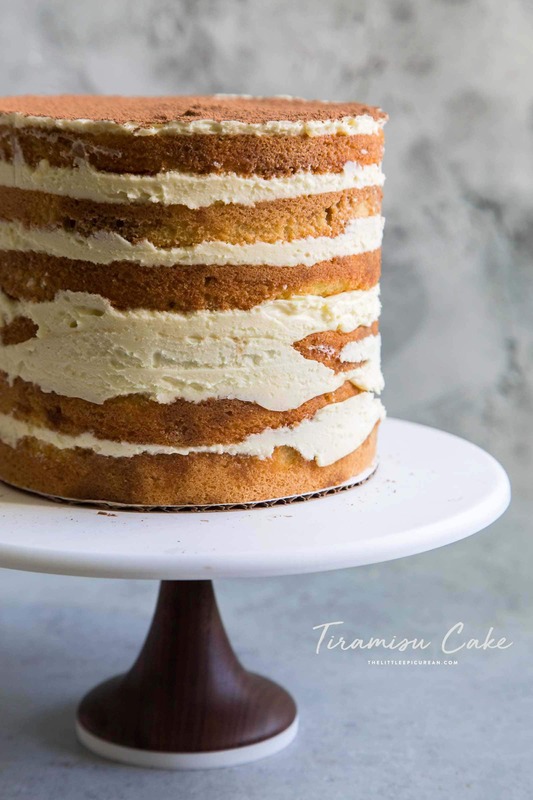 Layer another cake on top and repeat until final mascarpone sabayon filling has been added. Combine cocoa powder and powdered sugar in a small bowl, Dust the surface of the tiramisu cake with cocoa-sugar mixture using a small sifter/strainer. Cover with plastic wrap and allow to chill in the fridge for at least 2 hours or up to overnight. Remove plastic wrap cover. Gently lift cake ring off cake. Gently peel off acetate sheet. Slice cake and serve chilled, or allow to warm to room temperature. Bain-marie: fill a pot with about 1-inch of water and bring to a simmer. Do not allow water to touch mixing bowl. Happy New Year! And holy layers!! What a beautiful cake and I bet it was so moist and delicious. I’d love to try and tackle a mini version of this, too. Cheers to 2018! !